Long-time Triumph & Despair reader, friend of the blog, and known galactic criminal Brendan Flattery has graciously put together a beautiful new product. Now, fans of the Edge of the Empire Alphabet may read the compiled first run of 26 articles, with bonus Appendix Full of Stars; leisurely, conveniently, and in a handy, portable fashion with the Edge of the Empire Alphabet eBook. Check out the links below to grab this awesome, free product in both ePub and Mobi formats. I’ve heard many requests for consolidated lists of these articles and I’m really happy and proud to show off the work Brendan has done here with this eBook. I hope you all enjoy it! This product is licensed under Creative Commons. Licensees may copy, distribute, display, and perform work and make derivative works based on this product only for noncommercial purposes. 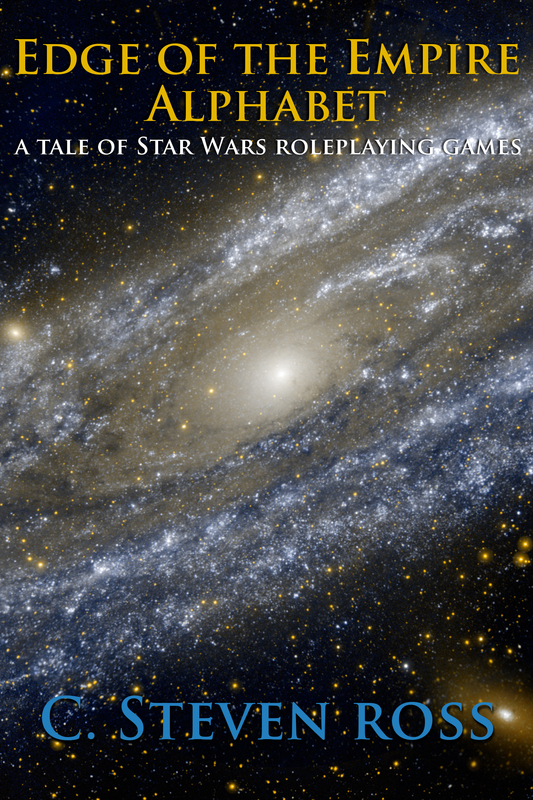 This entry was posted on Monday, July 15th, 2013 at 10:14 am	and tagged with campaign design, ebook, Edge of the Empire, exploration, gaming aids, it's a trap, jawas, jedi, kessel run, map, motivations, puzzles, random tables, rebel scum, rpg, sandbox, secrets, SpaceCore, Star Wars, starship, stormtroopers, tabletop games, z-95 headhunter and posted in EotE Alphabet. You can follow any responses to this entry through the RSS 2.0 feed.